On 22 April 2014, after two years of fights and attacks on workers’ rights, ETF affiliate TÜMTİS (Turkish Motor Vehicle and Transport Union) succeeded in concluding a more than five months long negotiation process and signed a Collective Bargaining Agreement (CBA) with DHL. With this CBA, DHL becomes the second multinational company in Turkey with organised workers. 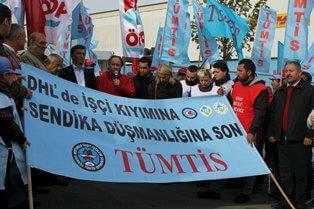 In April 2011, 30 TÜMTİS members in DHL were dismissed for their trade union involvement and attempt to organise workers in their workplace. The company started an intimidation campaign by for example setting up a company friendly union and by forcing workers to sign up, upon threat of dismissal. As an act of resistance, peaceful picket lines were organised at two DHL workplaces in Istanbul, manned for more than 300 days. Solidarity visits were made by ETF and ITF delegations as well as by Evelyn Regner, Austrian member of the European Parliament. The CBA applies nationwide and covers over 2,200 members, providing them with, among others, social security and a wage increase between 32 and 46%. The contract also regulates DHL’s use of subcontracting and reinstates 25 dismissed workers.